Since Final Fantasy XIV’s Stormblood expansion launched in early access on Friday morning, I’ve leveled a Red Mage from 50 to 60 and taken my first steps into the city state of Ala Mhigo. Imagine what I could have accomplished had the servers been anywhere near stable! While the crux of the Stormblood expansion involves characters venturing into Ala Mhigo and the Asian-inspired Doma with the intention to free them from the oppression of the Garlean Empire, I spent precious little time in the new areas. This was mainly due to the fact that one of the major progression quests for the new lands was nearly impossible to complete for the first two and a half days of early access. When a special cinematic solo quest begins, the game creates a special instance just for the player doing the quest. Slammed with players new and old all attempting to do the quest at once, the game’s servers were having trouble creating new instances, leading to players lining up or gathering around the quest giver, desperately trying to move on. Some players made it through. Others were kicked back to the same area after the quest’s cinematic played, having to start the process over. The problem wasn’t limited to the one quest, either. I spent a large chunk of Saturday trying to log back in after a Red Mage quest disconnected me from the game upon trying to enter it. I could log other characters in, but my poor Red Mage was stuck in an endless disconnect loop. As an added bonus, my server (Goblin) had a login queue for most of Saturday, so I was essentially lining up to be disconnected from the game. Instead of spending time in the new lands, I did what I could in the older areas. First I logged in to my original character, Back Clawtooth, and fiddled around with his revamped skills. The Stormblood expansion brings with it a massive change to the game’s skill system. Core powers and abilities for each job have been removed or consolidated in order to make the game more approachable and less complex. It seems to work, though there’s a bit of a learning curve. Unfortunately Back hasn’t finished Final Fantasy XIV’s story quests leading up to Stormblood, so I set him aside (for now) in favor of a new character. This is Clan. Clan Destine. I created her for the expansion, leveled her to 60 and completed the game’s story using potions available in the game’s offline store for $25 each (one for experience level, one for story progress). The idea was to take her through the new areas as a level 60 Black Mage, but when I hit the quest roadblock I decided to take her in another direction. The Red Mage is an interesting class, balancing White and Black magics and using it to power ridiculously strong melee attacks. In groups it’s a lot of hanging back, rotating a series of spells to help fill both sides of an on-screen meter. Once filled, the Red Mage rushes into battle, takes some powerful swipes and then leaps right back out. It’s casting damage plus melee damage, the best of both worlds as far as I am concerned. Immodest Mouse’s cities full of ashes are huge and impressive, or so he keeps saying. The new jobs start at level 50, so I had to earn 10 levels before trying the new area quest again. That worked out rather well, as the older areas of the game where I performed repeatable Fates (dynamic spawning quests for large groups) in order to level were stable for most of the weekend. Leveling went by quickly, and the only real issues I ran into were some of the aforementioned instances. It was not a smooth start for Final Fantasy XIV. There were times I couldn’t connect to the game at all. Players reported the game crashing on PlayStation 4, requiring the entire thing be reinstalled in order to fix it. 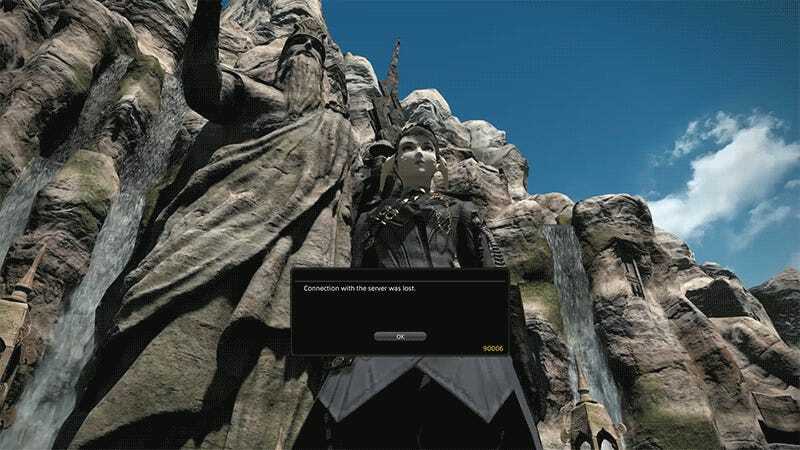 Game producer Naoki Yoshida took to the forums on Saturday, apologizing for the problems and ensuring players fixes were in the works. I finally managed to complete that first story quest in the new area late last night. The crown around the NPC had vanished, and chat was lit with reports of success. Looks like the major issues should be cleared up for the expansion pack’s wide launch tomorrow. I completed the initial set of quests in the area, which left Clan Destine a sliver below level 61. I hopped into the leveling queue in the hopes of getting a random dungeon group to help earn the extra experience points. After waiting over a half hour the instance began to load. Then . . .
Look for more on Final Fantasy XIV’s Stormblood expansion as we continue to explore the new lands, servers willing.